A Modest Proposal for Preventing the Children of Poor People in Ireland From Being a Burden to Their Parents or Country, and for Making Them Beneficial to the Public, commonly referred to as A Modest Proposal, is a Juvenalian satirical essay written and published anonymously by Jonathan Swift in 1729. Swift suggests in his essay that the impoverished Irish might ease their economic troubles by selling children as food for rich gentlemen and ladies. 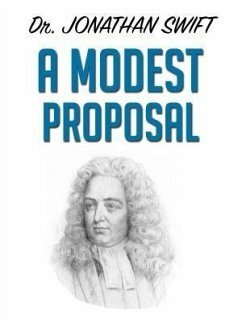 By doing this he mocks the authority of the British officials.A Modest Proposal is included in many literature programs as an example of early modern western satire. It also serves as an exceptional introduction to the concept and use of argumentative language, lending itself well to secondary and post-secondary essay courses. Outside of the realm of English studies, A Modest Proposal is a relevant piece included in many comparative and global literature and history courses, as well as those of numerous other disciplines in the arts, humanities, and even the social sciences.